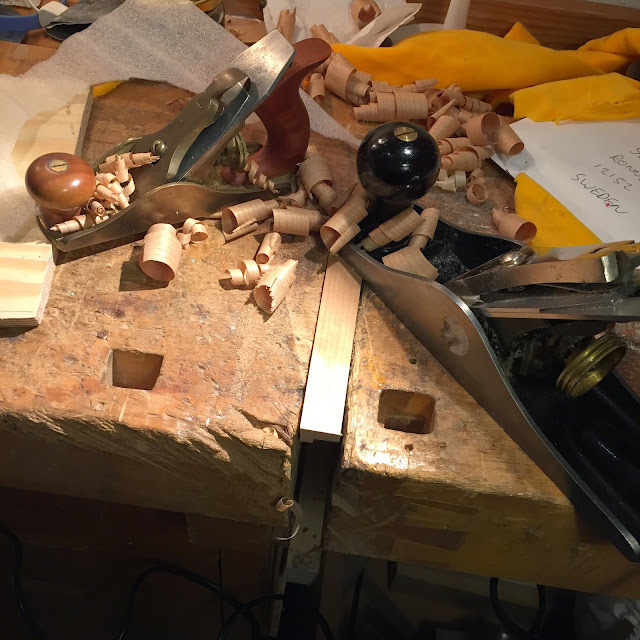 My daughter has a block of mahogany that she planed with the Lie Nielsen no.1, and now she's polishing it with shellac to get it shiny. So this morning she used my go to muneca, the raggedy one with stripey parts. The jar holds my collection of munecas. With company in the workshop I wanted to give the piccolos a coat or two of shellac. On today's schedule was fronts and backs (yesterday was sides and necks day). With the best muneca busy, I dug into the jar and found my eraser model. That is an eraser wrapped in cloth. 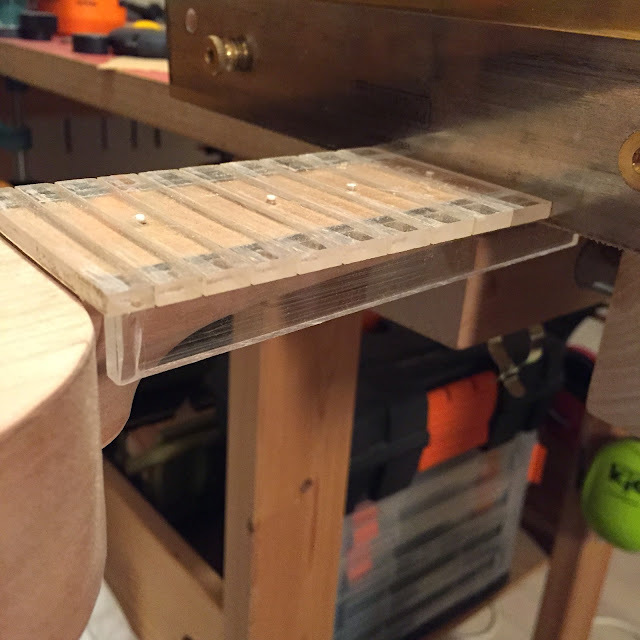 The sharp corners makes it well suited for use around bridges and fretboards, but I've used it less and less because of its inferior capacity to hold shellac. But I gave it a go and I must say, it's darned easy to use and it gives a great surface. So, a new routine shapes up. First a few coats applied with the brush. Most of this gets scraped off when levelled. 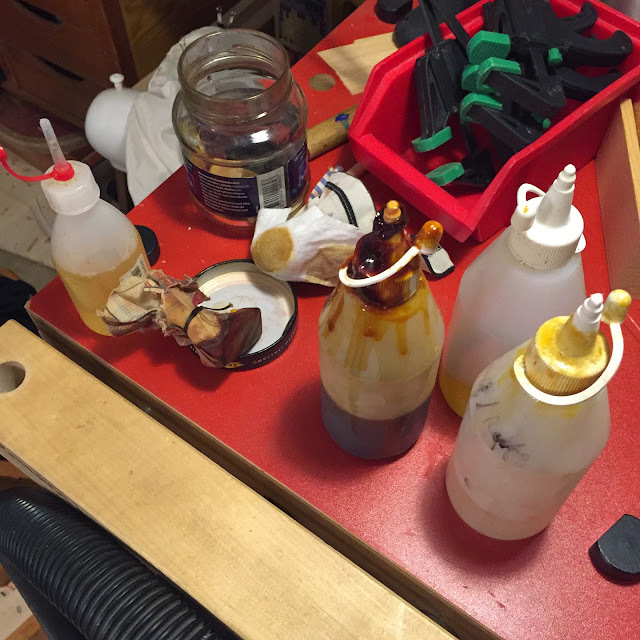 Then a number of coats with the soft muneca that holds larger quantities of shellac. Then the later coats with the eraser muneca, to give it a flatter surface directly from polishing. I'll let you in on how it works. Provided I remember to implement it. But another thing; look at this. The ninth reso under way. How many pics can I get into one post? Should I divide this in two? Nah. Let's get it done with. It was time to set the height and the bottom contour on the bridges. First I dial in the height by planing. 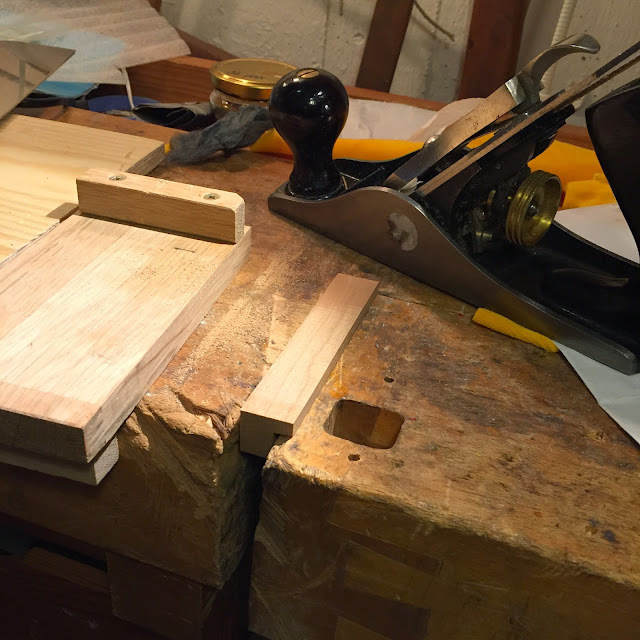 I stick the plane in the vise and move the bridge, which is too small for clamping. 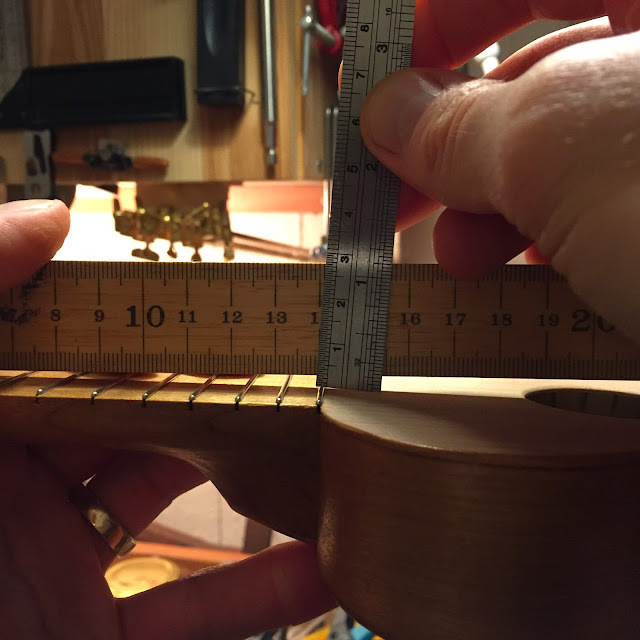 ... checking the progress by measuring the action at the 12th fret. When I'm pleased I scrape the bottom to get a better surface for glueing. Now the layout. 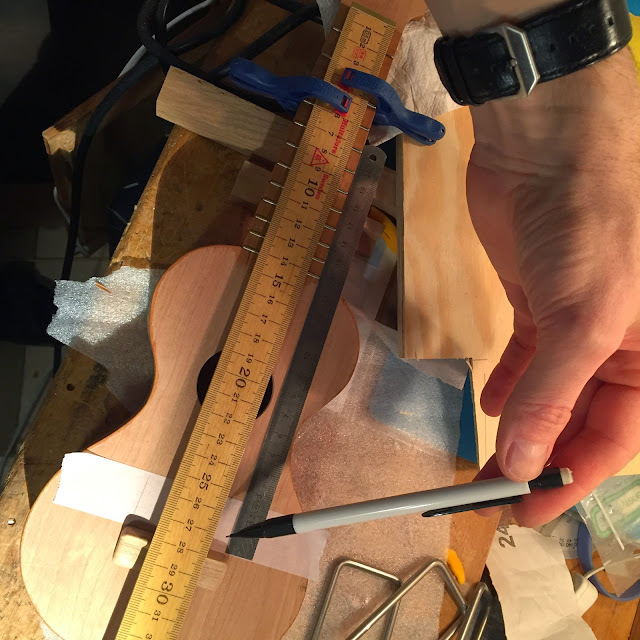 I set the distance using my wooden ruler lightly clamped to the neck. This is very effective since one tool does two things, holding and measuring. Then I put a piece of low tack masking tape at the front edge of the bridge. I used to fret a lot about getting this piece perpendicular to the center line but now I just wing it and get better results. More tape. Then the paths of the A and G strings are traced and marked on the bridge. 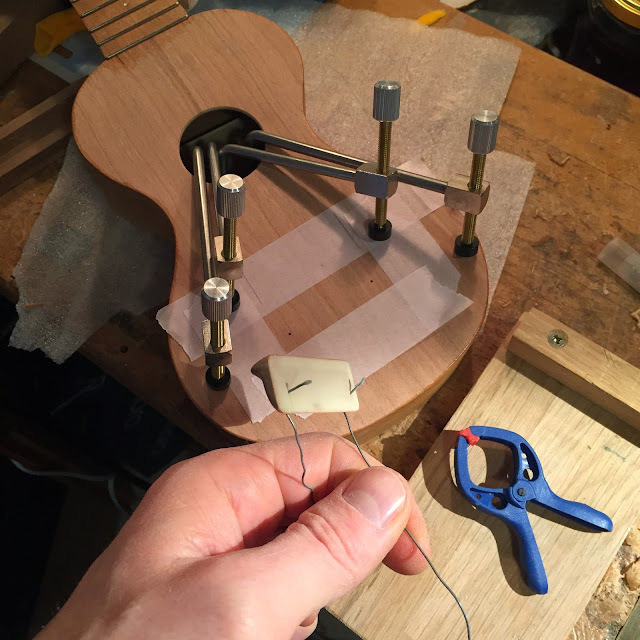 I drill the string holes with a tiny hand drill. This one has all but replaced my tiny power drill. 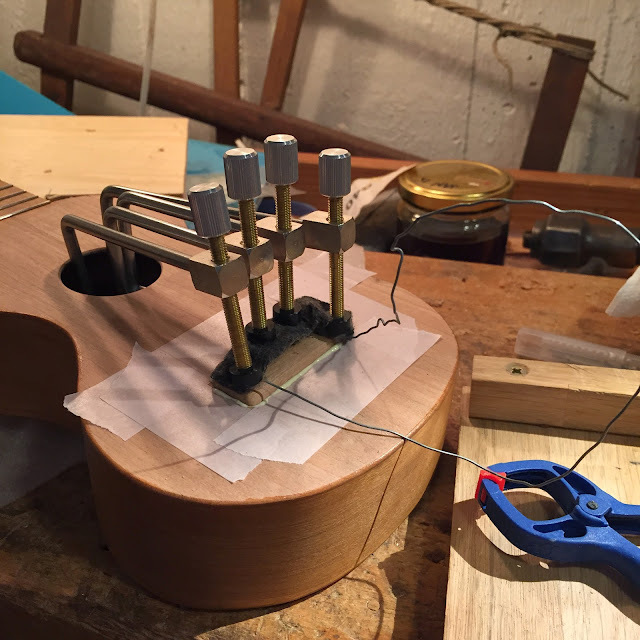 The holes are angled to guide the strings towards the soundhole. Clamps ready. Glue spread. Wire in the holes. And this is the final pic, just to show you that all went well. 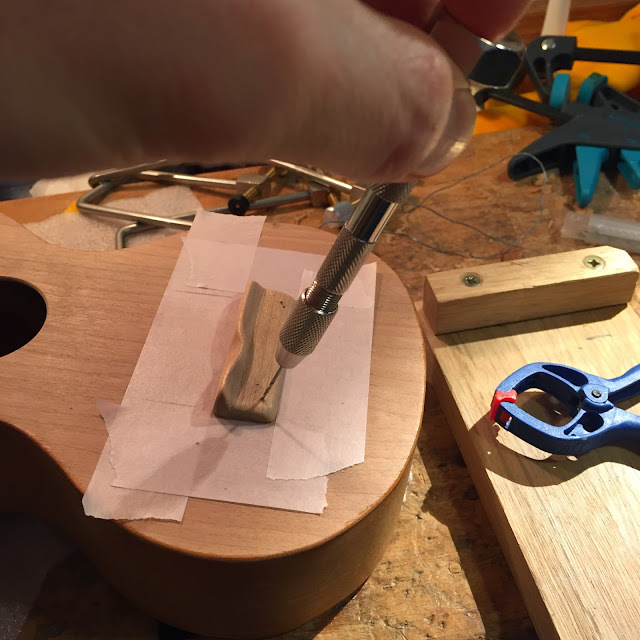 And after writing this post it's time to scrape off the excess glue. It should have gelled by now. Hello? Hello..? Anyone still here? 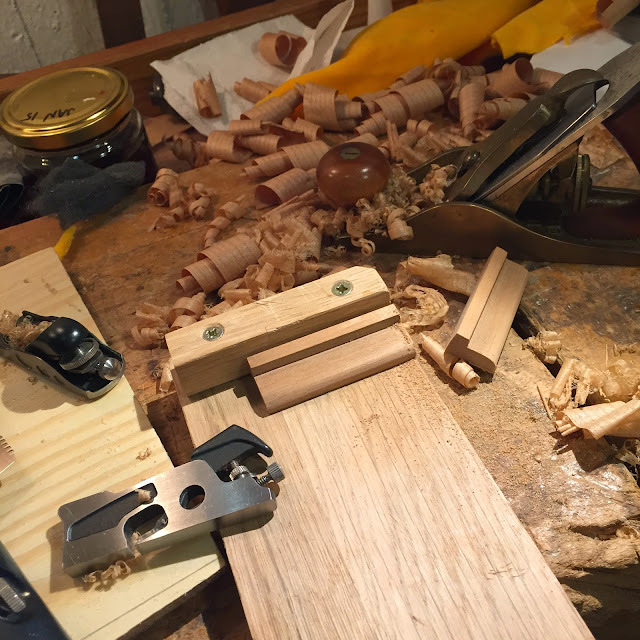 Yesterday, after returning from the Middle East, I started making the bridges for the piccolos in progress. Actually I finished fretting them before, but didn't blog about it. I found a small length of very rough bridge blank in the piles and started planing. 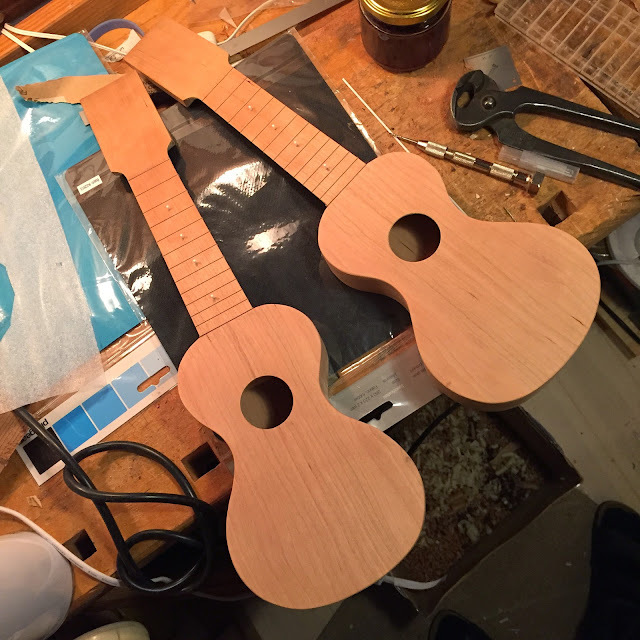 The neck angle and the dome of the soundboard was identical on both ukes so I set out on a double length piece. After progressing to smaller planes (equivalent of "going through the grits" for those who prefer sandpaper) I had the profile and the height. 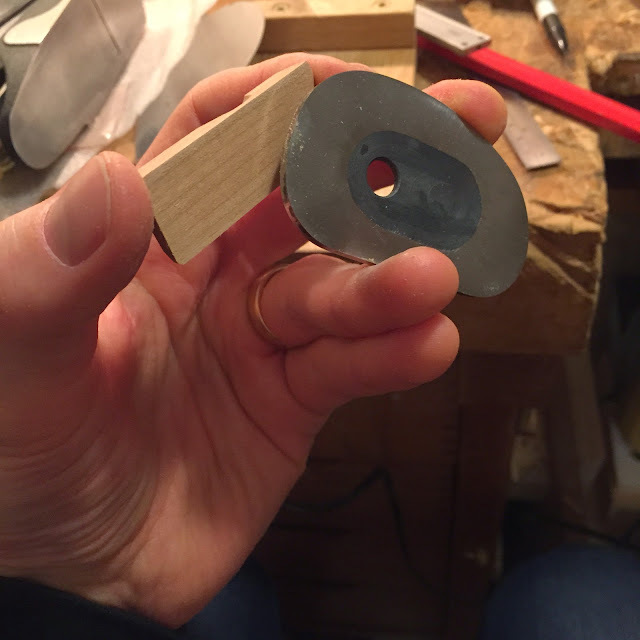 The bottom will be concave to match the top so I have an extra millimetre still. Cutting time. Then the top edge is carved for compensation. Here is what it looked like this morning. You can see the frets too. 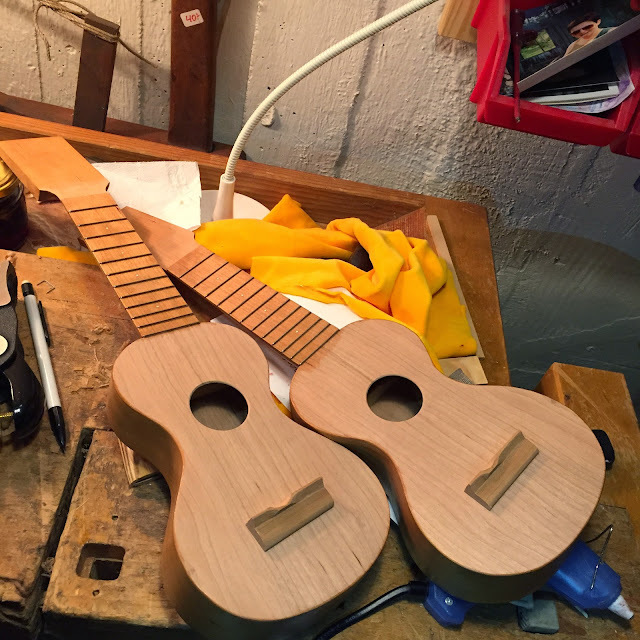 I fit the necks to the piccolo sized ukes before slotting for frets. 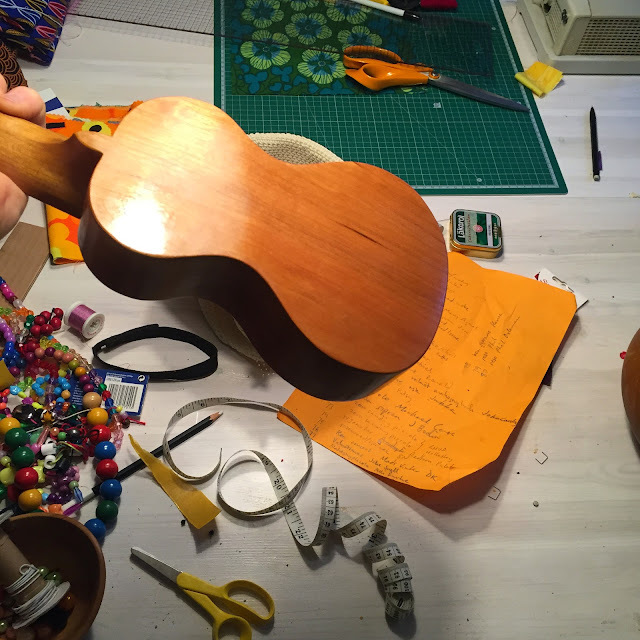 Since these are Swewaiian style ukes they won't get a fretboard, instead the frets are seated directly into the neck. 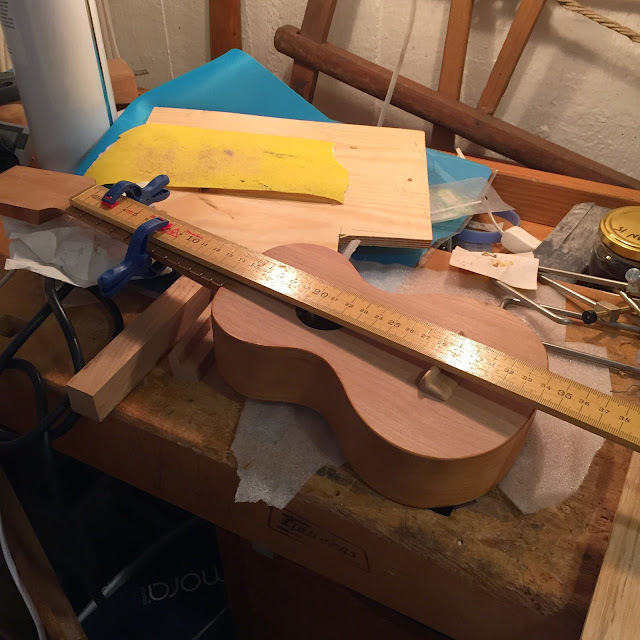 I want the 12th fret to be exactly at the neck to body joint, a location that is largely unknown before the neck's in place. 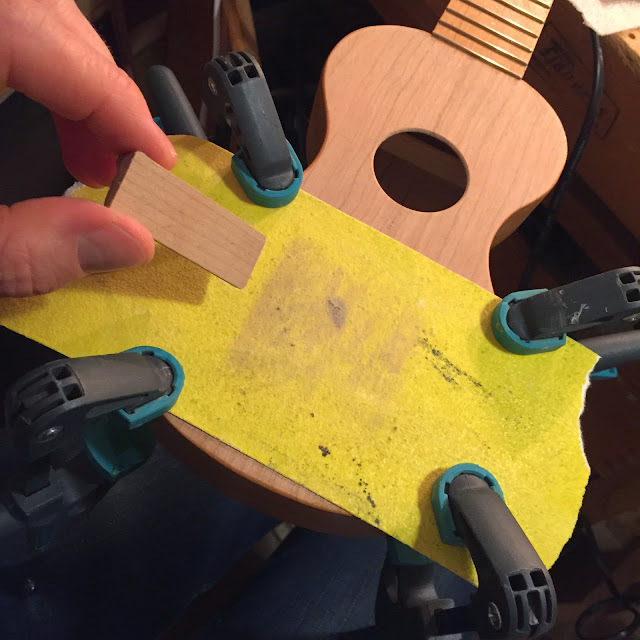 During fitting and alignment the heel end might get shorter, and the joint may well be off square as long as it all lines up and any skew is within the width of the fret crown. 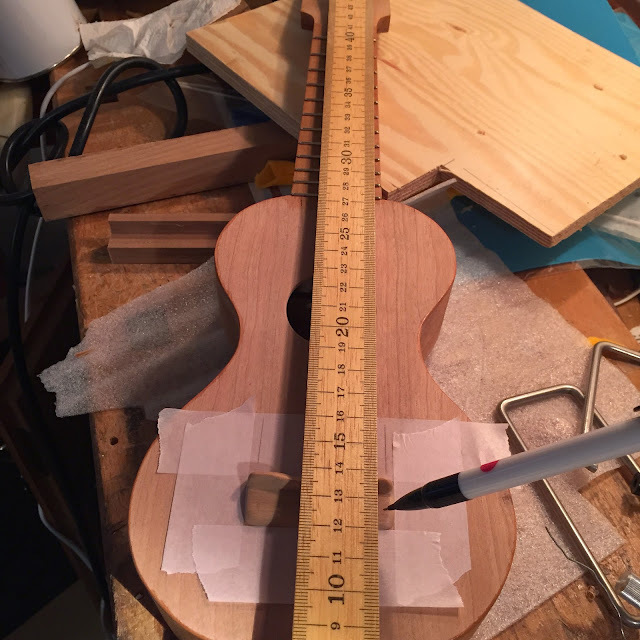 So, I've made a fret slotting template that goes on the neck as you can see in the first pic. 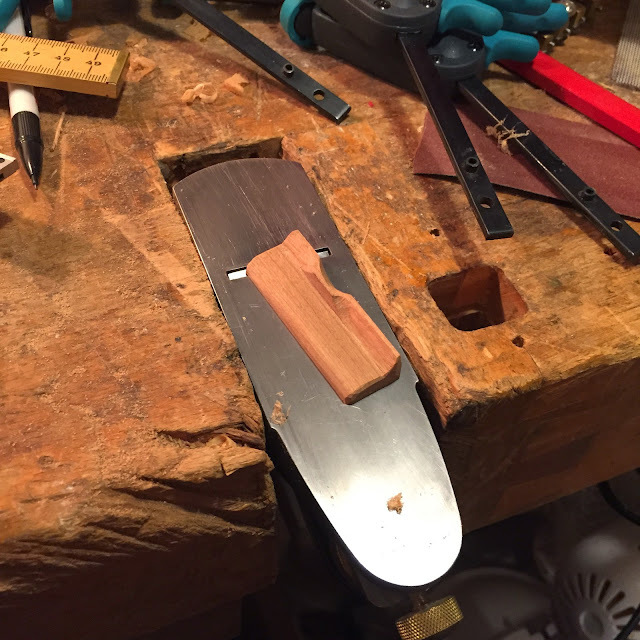 The saw I use is from Stewmac and has a depth stop. 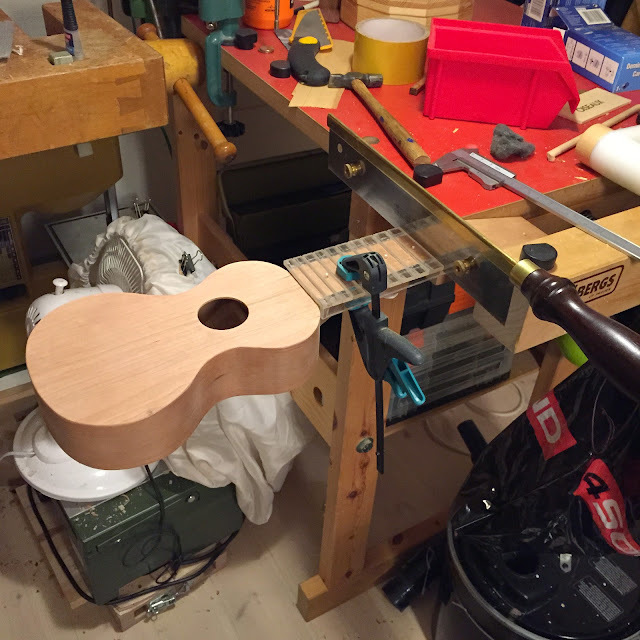 The perspex in the jig is 4 mm, the tang of the frets are 1.4 mm so I set the stop to give me slots deep enough without being too deep. I don't mind a miniscule gap under the tang, that's better than a poorly seated crown. And it's good for sucking in some ca glue too. 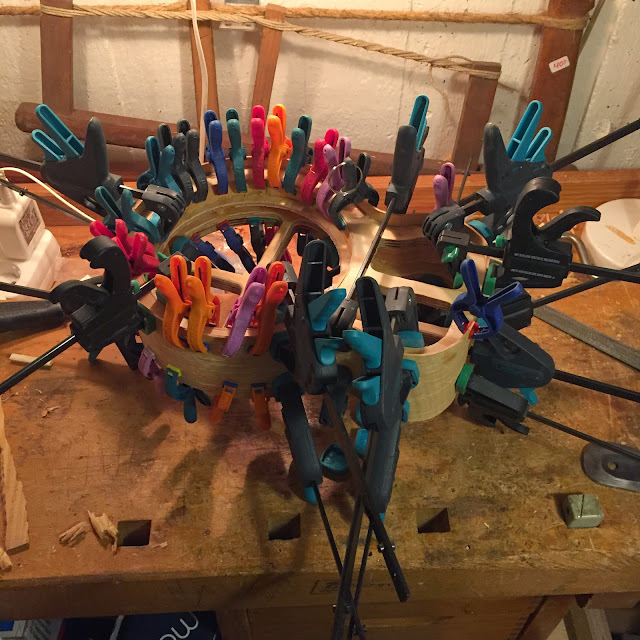 Thirteen slots cut. 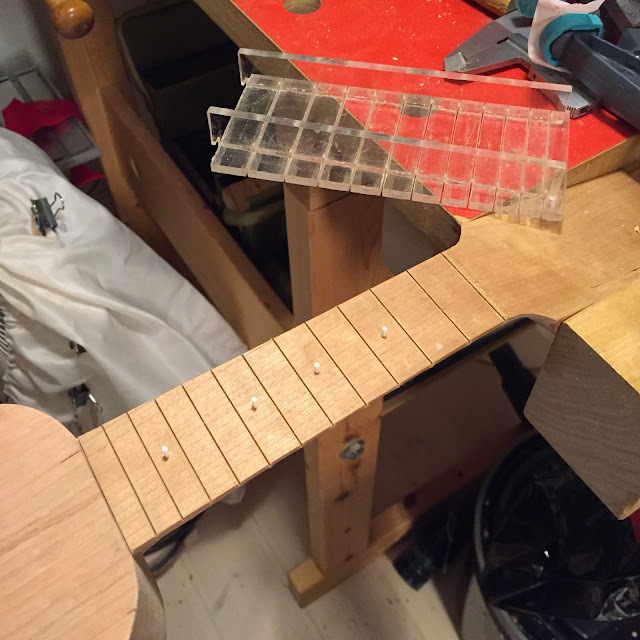 The one at the top isn't for a zero fret, I'll use it for creating a ledge for the bone nut. You can also see the jig from underneath. And here they are, remarkably similar to real instruments. I'll give them a wash coat of shellac before fretting. Yes. I know I've shown all of this previously. But that's the point of a diary innit, repeatedly and endlessly mulling over simple things. I do give you new chisel pics now and then don't I.